MPL announces an expansion of this rugged Switch Family. The new products is a 10-port Open Frame Switch that includes two 10Gbit SFP+ ports and still conforms to MPL's high standards like; long-term availability, extended temperature capability, flexibility, and low power requirements. The new MAXBES Open Frame Switch integrates 8 ports with 1Gbit (optional up to 4 as SFP) and 2 ports with 10Gbit speed. The eight 1Gbit ports are with lockable headers and the two 10Gbit ports are SFP+. The Open Frame Switch is also available with RJ45 connectors. With an optional LED board, you can monitor the activity of each port. 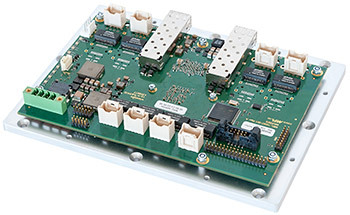 The MAXBES Switch is extremely compact and is mounted on a rugged aluminum plate. There are also open end cable available for a easy system integration or custom cables depending on your needs. The input power requirement of the device is 8 - 36VDC and comes with reverse polarity protection (optional with redundant input) and less then 15W power consumption at full operation. The product can be operated at -20°C up to +60°C. All on market available 1GBit Ethernet compatible SFP transceivers (according MSA) can be used. It allows the users to select the appropriate transceiver for each link. The SFP+slots support 10GBit and 1GBit Ethernet compatible, MSA compliant SFP+ modules. These and other functionalities make MAXBES the ideal candidate for any robust, industrial and secure network application. Due to the low power consumption, robust and flexible design, the product is well suited for embedded systems and solutions. For depopulated versions, please contact MPL directly.